Clearing Storm Drains How Can You Help? The Ada County Highway District has crews who help clear and clean storm drain inlets, but with fall leaves piling up and plenty of precipitation in the forecast, the ACHD is asking residents for help. If residents clear storm drain grates in their neighborhoods it will go a long way in preventing problems. A blocked storm drain can lead to ponding on sidewalks, driveways and in roadways as water attempts to flow into to the storm drains. As the temperature begins to fall at or below freezing these areas will often turn to ice, creating hazardous conditions for all modes of travel. Residents who see storm drains covered by leaves, snow or any other debris should remove the debris from the top of the grate. Do not attempt to move or adjust the grate itself. 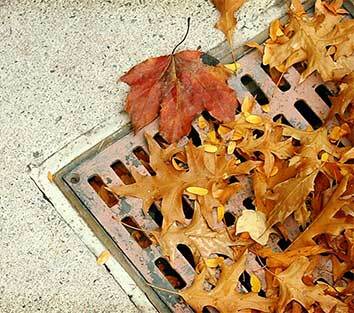 When discarding leaves from your yard do not blow or rake leaves into the streets or gutter. Similar drainage problems occur with snow and ice. 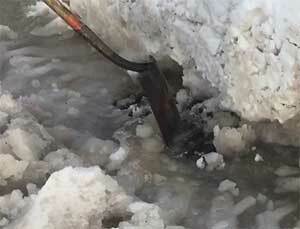 Removing snow from the top of the storm drain grate will allow water to flow into the drain as the snow begins to melt. Shovel snow from sidewalks and driveways away from streets and gutters. Locate your neighborhood's storm drain inlets, using our storm drain map.